World No. 1 Rory McIlroy via Instagram. Brian Keogh is a golf correspondent for The Irish Sun and a contributor to The Irish Times, Golf Digest Ireland and other golf publications. The following excerpt from Brian’s Irish Golf Desk is used with permission. RORY MCILROY MIGHT MISS THE OPEN Championship and the US PGA but Irishman and world No. 46 Shane Lowry reckons the Holywood star should not be crucified for playing football with his mates. The Clara star, who was speaking at his announcement as the new brand ambassador for Heaton's Irish golfing apparel Kartel, heard the news on Saturday and reckons people should try and keep things in perspective. Lowry said: "It's not ideal for him because he's wearing that boot and he's going to have everyone in the media on his back now. But should he be playing football? I don't know. He likes playing football, and he likes playing football with his mates. What's wrong with that? "I mean, he's only 25 or 26. It's a case of, 'let's go out for a kickaround'; 'yeah, no problem'. "People think because you're good at something you should just do that and focus on that, but that's not what life is about. Obviously his career's after suffering now because of it, but it's not the end of the world. No one's after dying." 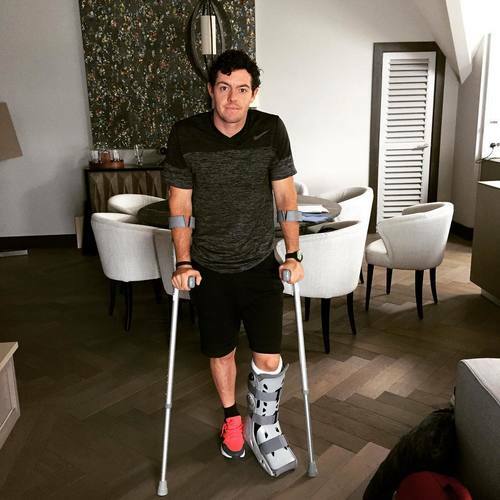 McIlroy is a doubt for the Open after totally rupturing an ankle ligament playing football with friends. The world No 1, 26, wrote on Instagram: "Total rupture of left ATFL (ankle ligament) and associated joint capsule damage in a soccer kickabout with friends. Continuing to assess extent of injury and treatment plan day by day. Rehab already started." Brian Keogh covers golf for The Irish Sun and contributes to a variety of golf publications. Pay him a visit at Irish Golf Desk. "People think because you're good at something you should just do that and focus on that, but that's not what life is about." Almost the same negative comments from the golf channel analyst John Feinstein heaped upon Tiger(hurt is knee training with Special Ops)that he is now dishing on Rory. The problem has always been sports writers see these great players as God-like,the players like Tiger,Rory and all others see themselves as just people.